Mary Flores claims Christ is born again, and it is her baby. 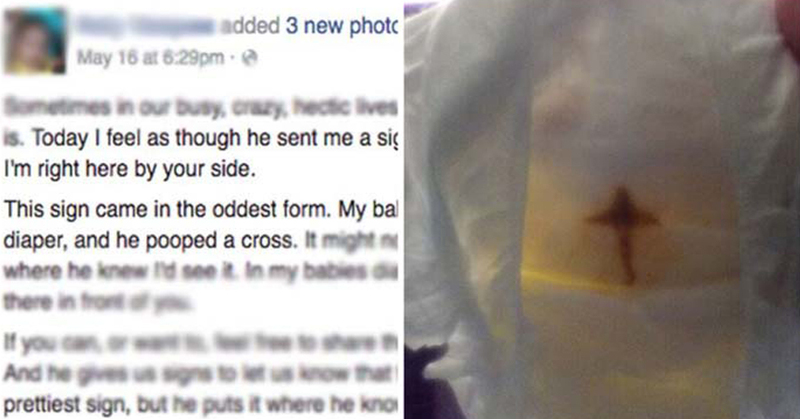 She claims she has seen the sign of the Lord in her son’s dirty diaper. She immediately Snapchatted the cross of poo she found in her son’s diaper, where all her contacts proclaimed it a miracle. She has preserved the diaper in a display case, welcoming those who want to see the miracle. The diaper has not yet been evaluated by anyone from the Vatican, but Flores hopes to have the Pope bless the poop.